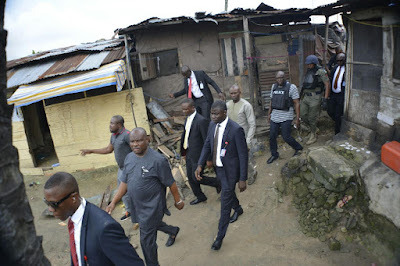 In continuation of the Anti-Cultism War of the Rivers State Government, Governor Nyesom Ezenwo Wike on Saturday led security agencies to root out cultists and kidnappers at the Eagle Island neighbourhood of Port Harcourt. The governor and the Rivers State Commissioner of Police, Mr. Foluso Adebanjo supervised the demolition of two deadly cultists camps in the area. One of the camp is located behind the Redeemed Church and the other camp is known as Andoni camp. Governor Wike announced that a police station will be built at the cultists camp behind the Redeemed Church, while a community hospital while be built at the site of the demolished Andoni camp. Addressing journalists after the security operation, Governor Wike said that the entire cultists hideouts in the area will be demolished so that law abiding residents will live peacefully. He noted that the war against cultists and kidnappers will be sustained to ensure that people carry out their lawful businesses without molestation. The governor called on residents to always avail the security agencies the necessary information on the hideouts of criminals for action to be taken against them. He said : “There will be no hideouts in the state. This war against cultists and kidnappers will be sustained. We are happy with the results we are getting. The Rivers State Kidnap (Prohibition) Law Number 3 of 2009 as amended by the current Rivers State House of Assembly and assented to by Governor Wike provides for additional penalties, including confiscation of assets derived from kidnapping, cultism and related crimes. Also speaking, the Rivers State Commissioner of Police, Mr Foluso Adebanjo said that several suspected cultists and kidnappers were arrested during the operation. This is the second operation that Governor Wike has led in the course of one week.